In celebration of the 200th anniversary of the birth of John Ruskin (1819–1900), the most influential art critic of the Victorian era, the Gallery will present more than 90 paintings, watercolors, and drawings created by American artists who were profoundly influenced by Ruskin’s call for a revolutionary change in the practice of art. The exhibition includes a number of recently discovered works never before exhibited publicly. 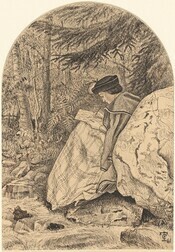 Ruskin’s rejection of traditional academic art and his plea for works that reflected a deep reverence for both the spiritual and scientific qualities of the natural world found a sympathetic audience in America among a group of like-minded artists, architects, scientists, critics, and collectors. New research, included in the exhibition catalog, reveals that the members of the Association for the Advancement of Truth in Art sought reform not only in the practice of art, but also in the broader political arena—most were abolitionists deeply engaged in the fight against slavery. Coded references to the Civil War are present in a number of exquisitely detailed landscape paintings that do not appear—at first glance—to carry symbolic meaning. Members of the group followed Ruskin’s dictum to record the natural world with strict fidelity, but they also created works that often include a rich political subtext. Organization: Organized by the National Gallery of Art, Washington. The exhibition is made possible through support from the Terra Foundation for American Art. Major support for the exhibition is provided by the Henry Luce Foundation.